I am compiling a set of questions and answers here in this section. Please feel free to send more questions, so others can share your concerns. Q: How real is this Ericofon? Is it one of those retro/knock off fakes that pop up on the internet? A: This is the real deal, a real Ericofon (Cobra) phone originally designed by LM Ericsson in Sweden in the 50's and later manufactured in the USA by North Electric in Galion, Ohio, in the 60's and 70's. North Electric became part of Ericsson in 1951 and was the producer of the Ericofon in the USA. Not too many phones survived since then in excellent shape or with original pieces, making this product unique and exclusive. Q: Do you alter or modify the shell or the mechanism inside the phone? A: No. The main goal in mind while designing the Bluetooth Ericofon was to keep the shell intact and to keep most parts as original as possible. There were many hours invested designing the circuitry and the mechanics inside the phone to avoid touching, altering or damaging the shell or the mechanism inside the phone. Only one internal part that hold the back screws is modified to make space to the switch and charger jack. Q: With what dial face and hook-switch button comes the phone? 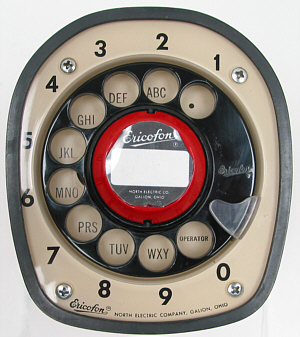 A: The phone comes with the original North Electric Company dial labeled Ericofon and a red hook-switch button. The dial is black and inside each finger hole are the corresponding letters used for letter mapping (2=ABC, 3=DEF, etc., and 0=Operator) and the numbers are located on the faceplate around the dial. Q: How do you turn the phone on and off? A: By dialing '1' using the rotary dial, the new version of the Bluetooth Ericofon turns on. The phone will stay on as long as it is connected to your mobile phone. If you go out of the Bluetooth range (e.g. leave the room) the Ericofon will beep prompting that it disconnected from your mobile phone. After 1 minute it will beep again warning that it will automatically turn off in 30 extra seconds if it you don't reconnect it again. Another alternative to turn the Bluetooth Ericofon off is by tapping (hook-flash) 5 times on the red (hook) button. Please refer to Operation for more details. Q: If I hook-flash the Ericofon twice to redial, does it redial the last number dialed the rotary dial, or the last number the cell phone dialed? A: Redialing was designed with security and privacy in mind. When you dial a number using the rotary dial, it only temporarily stores the digits to transfer them to the mobile phone and then initiates the call. When you command the Ericofon to redial, it sends a command to the mobile phone to redial the last number stored in (and dialed from) the mobile phone, not the number stored in the Ericofon. Q: How long does a battery charge last? Q: How do you charge the phone? A: The Ericofon has a miniature jack above the switch located in the back where the original cord entered the phone's shell. The charger plug doesn't interfere with the phone gasket and the phone can be operated with the charger cable connected to it. Q: I noticed that the new adapter cable is a USB type. Can I charge my Ericofon connecting it to a USB port in my computer? A: Yes, you can connect it to your computer and you will be able to charge it via the USB port. You can use a 5 to 6 VDC adapter. Just make sure that you don't exceed 6 VDC. Q: What is the range of the Bluetooth connection? A: The Bluetooth Ericofon uses a class 2 device similar to your mobile phone and to a conventional Bluetooth headset that you may use in your car. Class 2 devices typically permit a range up to 10 meters, however, it depends on the objects obstructing the signal. A practical distance is around 2-5 meters for a good voice quality connection, probably more. Q: Do you sell kits to retrofit Ericofons? A: Sorry, I don't sell kits. It is hard to create a universal kit that fit and works with any Ericofon. Selling a kit would create more frustration from your side if the system doesn't properly work, and I want to avoid that. Q: I already have an Ericofon and want you to upgrade it. Can I send it to you and you upgrade it? A: Sorry, I can't upgrade/retrofit Ericofons for the reason that I explained above. It would be a time consuming task and may be as expensive as buying an already modified phone. Q: Why are your Bluetooth Ericofons so pricey? A: The original Ericofon is considered one of the most beautiful designed products and is a landmark in plastic industrial design. It is also part of a permanent collection of the Museum of Modern Art in New York City, making it an art piece, so, basically, you are obtaining a piece of art. The Bluetooth Ericofons sold here are original telephones, not reproductions or retro-looking imitations. Obtaining original Ericofons in excellent conditions isn't easy and there are not too many left in the world. My interest is on providing maximum possible quality considering that the phones are over 40 years old. These phones are original Ericofons with new base gaskets (mold redone from original old gaskets), with well working 'receivers' (earphone part), well lubricated and in perfect condition rotary dial mechanism. It is a very limited market and many components used here to create this unique telephone are expensive. Your telephone is a unique piece of art.